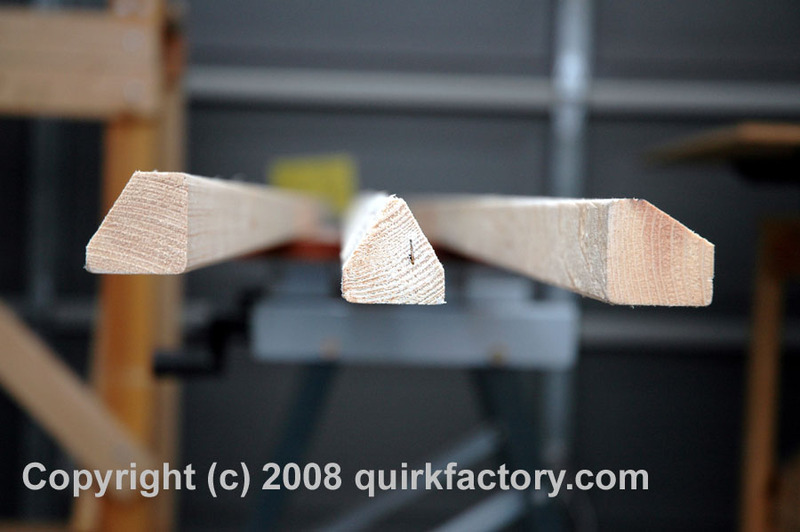 Cheap Wood Truss is a description of an eight foot wood truss I built for $10US. It is triangular and measures one foot (12 inches) on a side and weighs 12 pounds. It's surprisingly strong for the cost of materials. I'm experimenting with some largish robotic limbs, so I wanted to build a fairly cheap wood truss structure, just to measure how strong it would be. So the total cost was around $10US. I used the 2x2 8 foot strips for the three main poles in the truss. Here they are laid out after I beveled them. 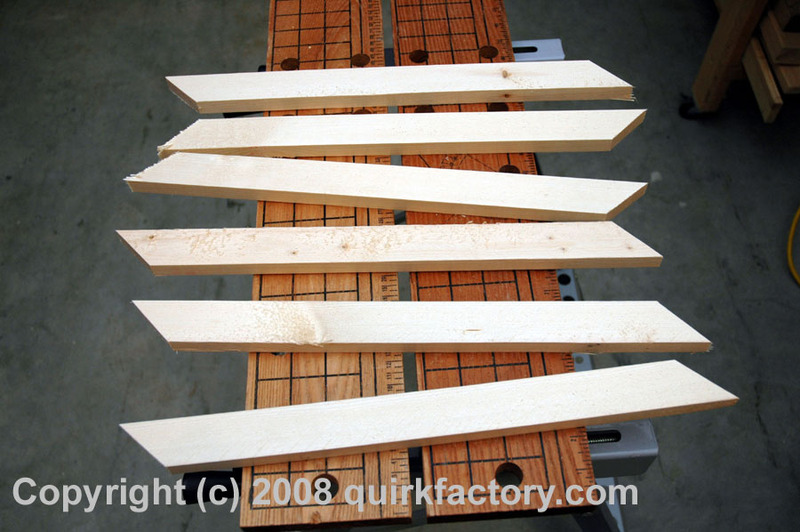 Here is a detailed picture of the strips after I beveled them. I wanted one side of the triangle to be flat, so I could more easily mount flat objects there. But otherwise the beveling is at a 60 degree angle so the support boards can be easily mounted. I cut a series of support boards using the 1x2 strips. 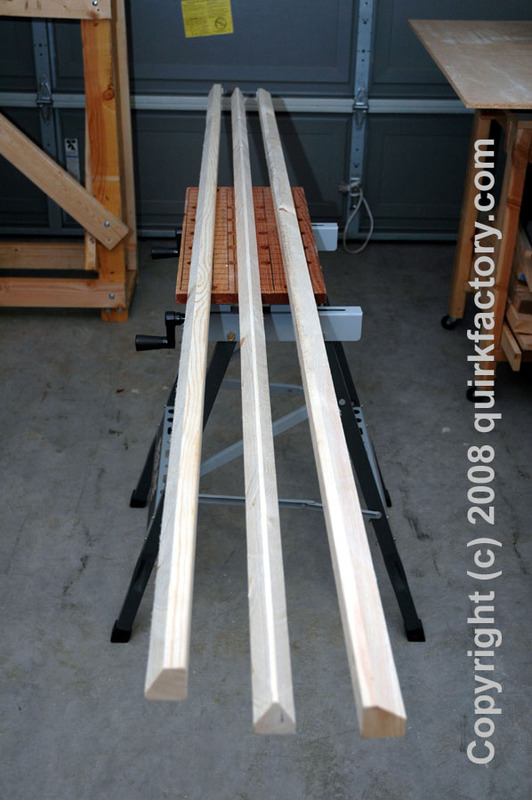 I wanted the truss to measure about a foot on a side, so I cut the boards 17 inches in length (12 * sqrt(2)), and cut the tips at a 45 degree angle. Here's a bunch of them lined up after cutting. After cutting the support strips, it was just a matter of attaching them with the drywall screws. Here's a photo of two of the poles getting stiched up with the support boards. 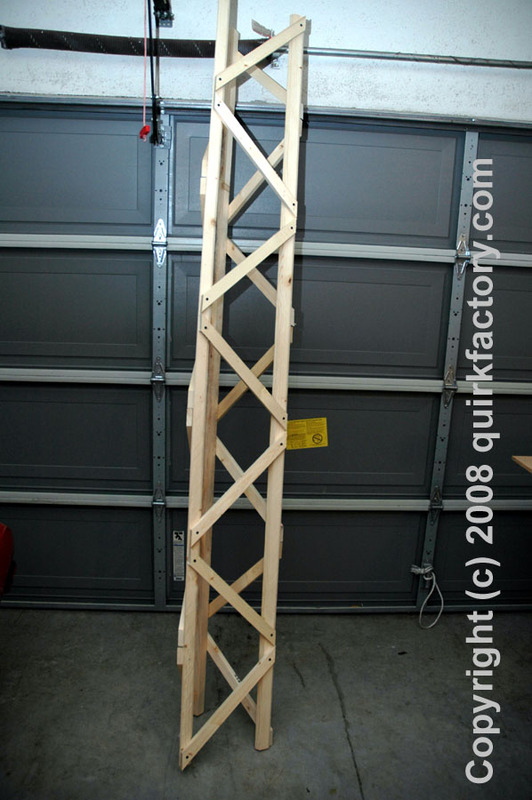 Here's a photo of the prototype truss standing up in the garage. 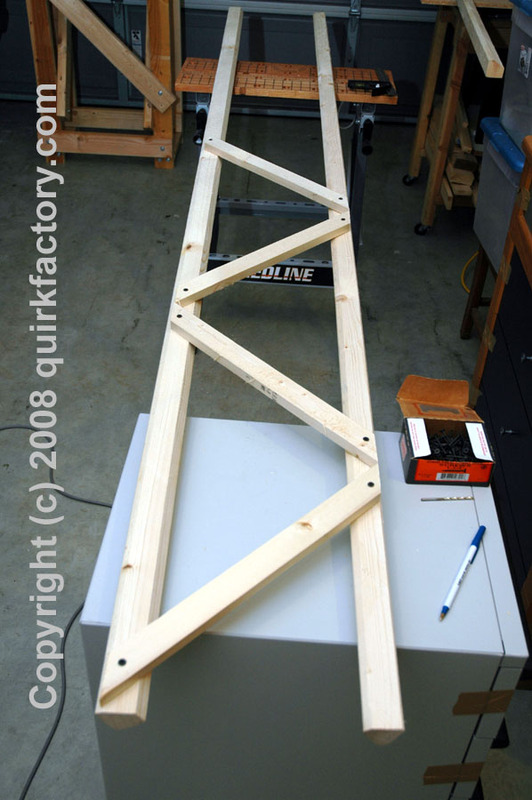 This first truss was intended as a prototype to see what a quick and dirty $10 prototype would be like. If I prop the two ends up on 2x4s and stand in the middle of it, it holds my weight (165 pounds) rather easily. The truss as shown weighs 12 pounds. So, the initial results are quite pleasing. I'm currently working on reinforcing the truss with more support members, to see how much weight it can hold.